One of our core areas of expertise is data analysis. But what does that entail, what is it used for and how can your company benefit from it? Have you ever wondered what your customers’ characteristics are? With our bespoke customer profiling service, we can dive into your data – whether it be website data or in-house database – to understand your customers better. You’ll get a better understanding of who your customers are – age, gender, interests or hobbies, if they prefer to surf online during the day or night. From this data, we’ll create customer personas for your key customer groups which can be used across a host of marketing channels from content marketing and organic search to paid search and social media. We’ve found that creating bespoke marketing messages from these personas can increase both conversion rate and ROI. Do you want to improve conversion rates? Understanding who is most likely to make a purchase gives marketing departments an edge. Stop wasting money on marketing to people who would never buy your product and focus on those that will. Using a variety of predictive modelling techniques, Further can turn your online or internal data into predictive scoring models. Using the model scores, we can segment your customer base into purchase groups allowing you to tailor your marketing message to get maximum performance. It doesn’t stop there, integrating the models output with A/B testing will ensure that the correct message is going to the correct segment. This ensures the best conversion rate for each segment. As part of our retainer services you’ll get regular detailed reports generated from our sophisticated reporting platform. This is valuable, useful information at your fingertips; data from multiple platforms compiled into one easy to digest place, delivered to you in a format suitable for company directors. Information from market-leading website tracking services such as Google Analytics and Adobe Marketing Cloud (Omniture Site Catalyst) is delivered in a high-level summary giving you the most important information when you need it. Visits, bounce rate and time on site are all valuable metrics helping you understand your website’s performance. For ecommerce sites, we’ll keep track transaction revenue and individual product performance across all marketing channels, ensuring your website is performing as efficiently and profitably as possible. We keep an eye on rankings for all your core keywords that drives traffic to your site. Comparing month-on-month rankings, understanding the value of a keyword and keeping a close eye on search share – the proportion of monthly searches that make it to your site. Whatever search platform is being used by consumers, we’ve got it covered, combining data effortlessly to give you the metrics needed to define complete paid campaign performance. We detail the core KPIs at an account, campaign ad group and even keyword level, giving you the detail needed to make decisions. 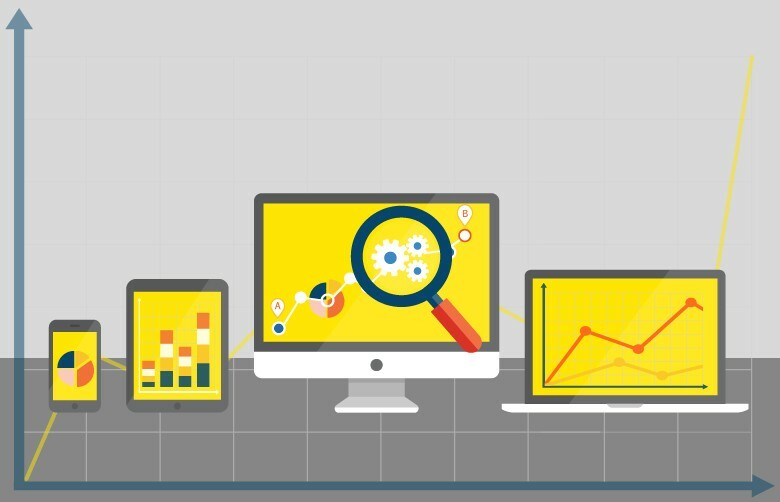 Why not read our article: 5 data analysis tools for understanding your digital marketing campaigns?